Los Angeles is a city of constant evolution. Its neighbourhoods, like famous film stars, transform and redefine themselves for each new role, as if they’ve lived a thousand lifetimes. 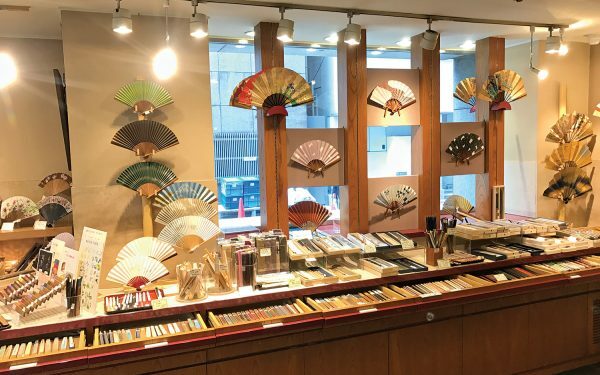 In the past few years, celluloid archeologists have pulled back the district’s layers and exposed long-dormant cultural gems. Today, Highland Park plays the role of a wise elder, returning to the curiosity and charm of her youth. Follow the winding freeway a quick ten minutes out of the forest of cranes in Downtown Los Angeles to a neighbourhood where historic restoration refuses to make way for demolition, and the ostentatious early 20th-century architecture clashes with 1970s concrete commercial blocks. While the Highland Theatre boasts a Spanish Colonial Revival facade and the restored 1927 Highland Park Bowl’s vaulted skylights recall dreamy Hollywood scenes, colourful street art covers the less presentable exteriors, and most commercial buildings house vintage boutiques, hip record stores and small art galleries. A monthly open studio night, Northeast Los Angeles Art Walk, is headquartered under the neighbourhood’s most recognisable landmark: Chicken Boy. The kitschy statue features a chicken’s head atop a human body wearing a red t-shirt and blue jeans, clutching a KFC-style bucket. Walk through streets lined with single-family Craftsman homes and palm trees to discover hidden murals and track down Salvadoran street food. 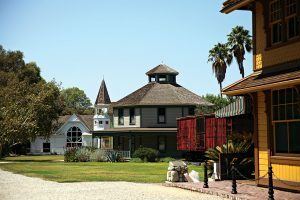 A few of the earliest Angeleno homes from the late 1800s were rescued from certain destruction by the historic preservation society and live at Heritage Square Museum, where docent-led tours take you back to an otherwise invisible era of the city’s history. Atop the neighbouring hill, Mount Washington, a peaceful garden and sweeping views give an overview of the entire neighbourhood. Back on the boulevard, ethnic restaurants and coffee shops serve up everything from Mexican pastries and Vietnamese comfort food to classic Italian and perfect California salads. 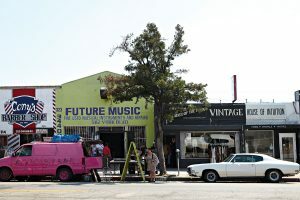 Today, the neighbourhood has perfected an Angeleno style of multicultural fusion, and visitors can see all the layers of Highland Park’s past exposed for a deep look into the rich art, ethnicity, and cultural traditions of Los Angeles. 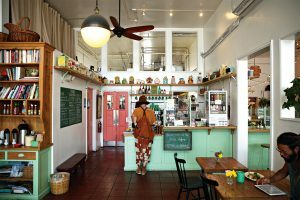 The crisp, bright vegetarian cafe contains just enough macrame, hanging plants, and vintage cookie jars to make Grandma feel comfortable eating foods of which she’s never heard. Although the brunch menu features meat-free spins on Mexican breakfast classics found elsewhere in the neighbourhood, the abundant herbs and clever uses of tempeh, jackfruit and tofu are thoroughly modern California cuisine. Los Angeles has spent most of its history demolishing the past, but since 1978, conservation efforts have halted much of the wanton destruction of 19th and 20th century city landmarks. Unfortunately, most of the Victorian homes that tell the story of the city’s early settlement were destroyed to make way for freeways and commercial centres. 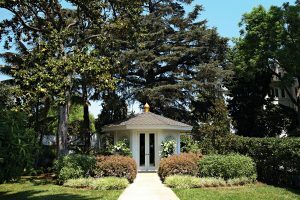 A few of the remaining structures were purchased by the museum and moved anywhere from two to eight miles across the city to take their place at the historical park of Heritage Square. Tours are offered on Friday, Saturday, and Sunday afternoon. Some of the city’s steepest hills and, consequently, some of its greatest vista points, are found in and around Highland Park. 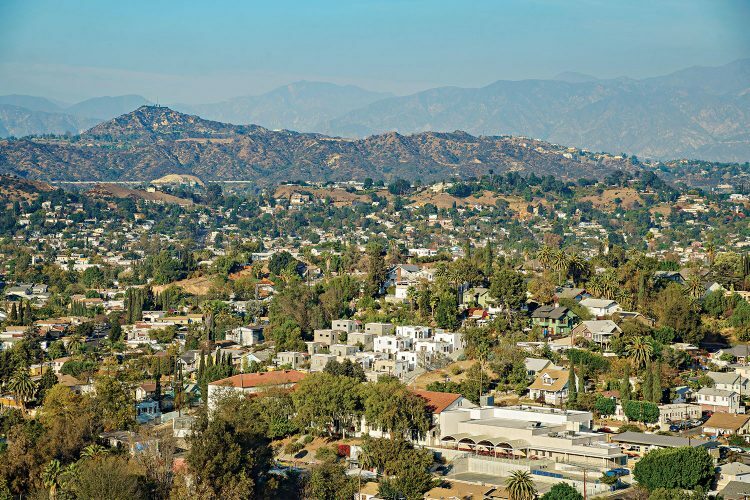 The district’s biggest hill, Mount Washington, is almost its own independent neighbourhood, where cliffside bungalows inhabited by urban hippies are nestled between desert foliage and hiking paths. A quick 20-minute climb up the small, winding streets from the metro station leads to a monastic yoga centre with lush public gardens perfect for lounging and admiring the view, or meditation classes and devotional chanting for the spiritually-inclined. If you’re not afraid of heights, try climbing back down the hill from the end of Cross Avenue, on the northeast end of Mount Washington, where an impossibly steep set of stairs descends down to Eldred Street, one of Los Angeles’ steepest roads. A vintage deli that’s been owned by the same Highland Park family for more than 100 years, the third-generation owner stocks a fizzy wonderword of rare, vintage and small-batch sodas and beers from all over the country. Whether it’s a step back in time to childhood or a curiosity for new carbonated flavours that piques the imagination, Galco’s has been the subject of many foodie TV programmes, as well as a location for fictional films and music videos. But most of the time, they’re just selling funky sodas to nostalgia geeks. A beloved hole-in-the-wall for more than 25 years, El Huarache Azteca’s namesake dish is a thick masa-based tortilla soaked in salsas and cream, with marinated meat or beans on top. 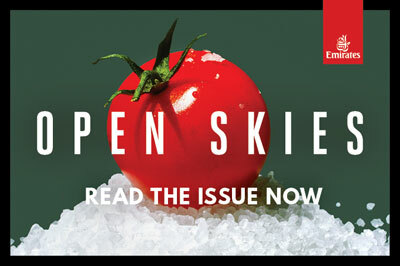 The unique regional speciality is not available in most of Los Angeles’ ubiquitous Mexican restaurants, but the concentration of Mexican eateries in Highland Park inspired the local entrepreneurs behind El Huarache Azteca to get creative, adding to the special texture of Highland Park’s restaurant scene. 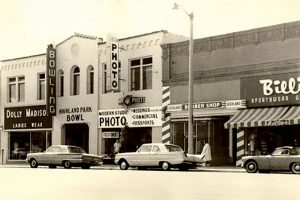 For two solid blocks between Avenue 52 and Avenue 50, art galleries, eateries, vinyl shops and vintage clothing stores have replaced the auto repair shops and hardware stores that used to define York Boulevard. Although this is ground zero for Highland Park’s gentrification, many long-time business owners have also thrived amidst the new upscale, trendy entries. 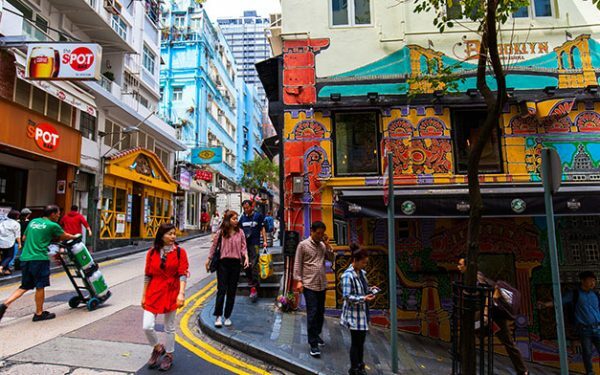 An amble through this commercial route, coloured by murals and street art, shows a sort of coexistence between neighbours new and old. 5000 – 5200 York Blvd, 90042. When the Highland Park Bowl’s owners bought the building in 2015, it had spent 40 years as a beloved dive bar and punk music venue anchoring the neighbourhood. Although transforming it from the iconic “Mr. T’s Bowl” was controversial, they managed to strip back the venue’s layers and find the original 1927 bowling alley, restored to its original facade and interior. They also discovered a prohibition secret about the doctor-and-pharmacy combination the building once housed, which prescribed and filled “medicinal whiskey” requests. 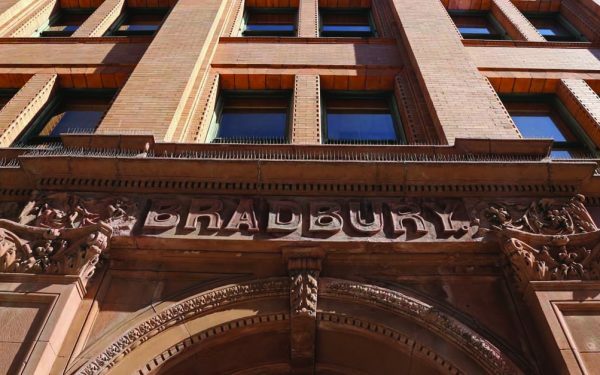 Today, the meticulous historical details, including displaying original bowling pins and club team banners, make it a glamorous reimagining of the past, complete with bowling lanes, local craft beers, and yes, whiskey. Discover a favorite pan dulce at another of Highland Park’s vintage Latinx establishments, the family-operated Delicias Bakery. Try the famous la concha, a sweet bread painted in pink, shaped like a conch shell, or ask for a fresh-blended vegetable or fruit smoothie, made to order at the counter.